When a new mother becomes manic overnight from a rare form of bipolar disorder, she stops at nothing to find the mental stability she needs to stay alive. After the birth of her baby triggers a manic maelstrom, Dyane Harwood struggles to survive the bewildering highs and crippling lows of her brain’s turmoil. Birth of a New Brain vividly depicts her postpartum bipolar disorder, an unusual type of bipolar disorder and postpartum mood and anxiety disorder. During her childhood, Harwood grew up close to her father, a brilliant violinist in the Los Angeles Philharmonic who had bipolar disorder. She learned how bipolar disorder could ravage a family, but she never suspected that she’d become mentally ill—until her baby was born. Harwood wondered if mental health would always be out of her reach. From medications to electroconvulsive therapy, from “redwood forest baths” to bibliotherapy, she explored both traditional and unconventional methods of recovery—in-between harrowing psychiatric hospitalizations. Harwood reveals how she ultimately achieved a stable mood. She discovered that despite having a chronic mood disorder, a new, richer life is possible. Birth of a New Brain is the chronicle of one mother’s perseverance, offering hope and grounded advice for those battling mental illness. "Dyane Harwood's Birth of a New Brain is a gripping account of the awful juxtaposition of childbirth and the onset of bipolar illness. Her book is an informative and important contribution to our understanding of this triggering of mental illness that happens more often than is generally recognized." – Kay Redfield Jamison, author of "An Unquiet Mind" and "Robert Lowell, Setting the River on Fire"
"With candid, explicit depictions of her compelling journey through postpartum bipolar disorder, Dyane skillfully brings the painful honesty necessary for growth in our field, as well as hope to those suffering. Birth of a New Brain is a rare resource that will benefit practitioners, their patients, and the public at large." – Shoshana S. Bennett Ph.D. Author, "Beyond the Blues: Understanding and Treating Prenatal and Postpartum Depression"&"Anxiety, Postpartum for Dummies, Clinical Psychologist for Perinatal Disorders"
"Dyane Harwood's new book Birth of a New Brain is a phenomenal gift to the mental illness community, especially for postpartum sufferers. Dyane's clever weave of gut-wrenching honesty entwined with intricate storytelling illuminates an under-profiled mental illness. Birth of a New Brain is an important addition to the world's mood disorder literature, and it will help those with perinatal and bipolar disorders of all kinds. Delve into Dyane's incredible story, one that untangles the baffling and under-reported illness of postpartum bipolar-disorder. Prepare to be moved. You won't regret it." – Wendy K. Williamson, Author, "I'm Not Crazy Just Bipolar" and "Two Bipolar Chicks Guide to Survival: Tips for Living with Bipolar Disorder"
"Bipolar illness is serious and widely misunderstood. When it emerges in the postpartum period, women and medical professionals are often blindsided due to the current lack of awareness. Birth of a New Brain is a brave and deeply personal account of how bipolar illness can impact a new mother. Her honest reveal of startling references such as mania, ECT, hospital wards, suicide and "tsunami obsessions" creates heartfelt transparency and highlights its stigma-busting potential. Postpartum women in distress will relate to Dyane Harwood's genuineness and be greateful for this book." "This is a story of when love alone can and cannot heal in bipolar disorder. It is a story of mental illness seen through the eyes of a daughter, a wife, and a mother. Birth of a New Brain was a privilege to read." "With artful prose and brutal honesty, Dyane Harwood depicts her struggle to have a stable, peaceful life as a wife and mother amidst the turmoil brought on by postpartum bipolar disorder in Birth of a New Brain. Despite many false starts, missteps, and even cruel and indifferent treatment at the hands of certain medical professionals she encountered, Harwood soldiered on and finally arrived at her own truth. The answers, for the most part, were inside her all along, and consisted of self-care habits, including healthy eating, sufficient sleep, and consistent exercise. Thoroughly researched with a wealth of resources for mothers and families, Birth of a New Brain is an invaluable resource and reference point for mothers grappling with shifts in mood after the birth of their children." "Dyane Harwood's book Birth of a New Brain is very timely. As the different lines of evidence are converging on a balanced and holistic approach in treating mood disorders, Dyane successfully weaves the latest research with personal insight to produce a very impactful roadmap for others towards recovery." "Birth of a New Brain is a candid portrayal of Dyane Harwood's lived experience of pospatrum bipolar disorder. In my 25 years of practice as a perinatal psychiatrist, I have not come across a book that left me so informed, moved and inspired. The mental health field owes her a debt of gratitude for all she has done to highlight the triggering role of childbirth in bipolar disorder. This is a must-read for mental health practitioners as well as sufferers of bipolar disorder." 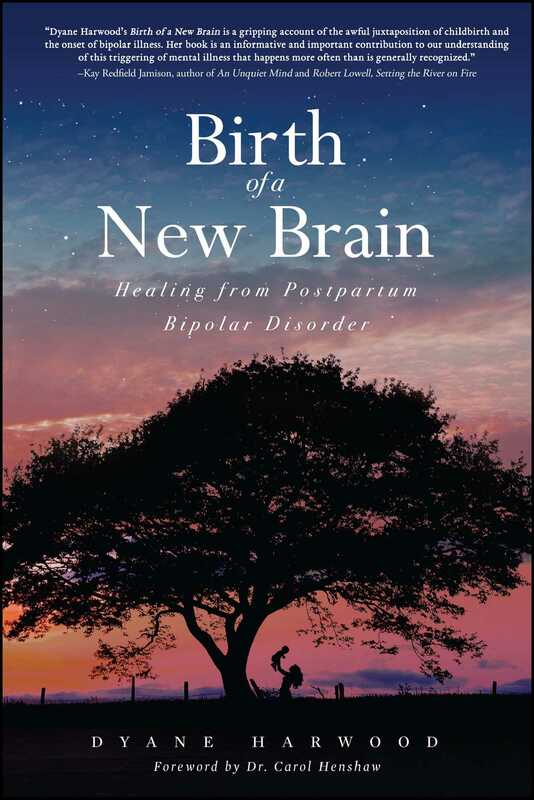 "Birth of a New Brain is essential reading not only for mental health care professionals, but for anyone who is suffering or knows someone who has been affected by bipolar disorder or a perinatal mood disorder. I admire Dyane for not only sharing her courageous journey, but also educating us about a subject that is not nearly discussed enough." – Lindsay Gerszt, Executive Producer of "When the Bough Breaks"
"With Birth of a New Brain, Dyane Harwood adds to the body of work on perinatal mood disorders by providing a thorough, moving account of her journey toward mental wellness after postpartum bipolar mania. Like many other women, because Harwood had no prior diagnosis of bipolar disorder and nobody caught the red flags in her mental history, she was unaware she risked a mental health crisis postpartum. We often associate bipolar disorder (pre-existing or postpartum onset/diagnosis) with postpartum psychosis may have an underlying bipolar disorder, not all of those with bipolar have psychosis, and not all those with psychosis have bipolar." – Teresa Twomey, JD, Author of Understanding Postpartum Psychosis: A Temporary Madness, Postpartum Support International State Coordinator, CT, and TEDxBushnell Park Presenter "What is Postpartum Psychosis?"